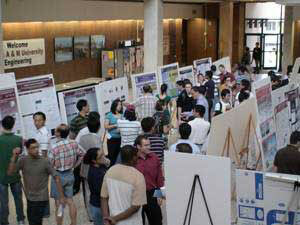 (Nanowerk News) The Department of Electrical and Computer Engineering at Texas A&M University sponsored the university’s inaugural Nano/Micro Poster Symposium to promote multidisciplinary interaction and scientific communication among students and faculty in the field of micro- and nanotechnology. The Department of Electrical and Computer Engineering sponsored the inaugural Nano/Micro Poster Symposium. The Department of Electrical and Computer Engineering sponsored the inaugural Nano/Micro Poster Symposium. The symposium started with an invited talk, “Three Dimensions of Individualized Nanomedicine,” from Dr. Mauro Ferrari, a world-renowned expert in nanomedicine. He is currently a professor and chairman of the Department of Nanomedicine and Biomedical Engineering and a professor of internal medicine, at the University of Texas Health Science Center in Houston, as well as a professor of bioengineering at Rice University and president of the Alliance for NanoHealth in Houston. This also was the inaugural talk for the newly launched monthly Texas A&M Nano/Micro Seminar Series. Following Ferrari’s talk was a poster session, which included more than 65 posters from various disciplines, with more than 150 people from 16 departments across campus participating. The steering committee was lead by Dr. Arum Han, assistant professor in the electrical and computer engineering department. Other committee members included: Dr. Arul Jayaraman, chemical engineering; Dr. Mike McShane, biomedical engineering; Dr. Dong Hee Son, chemistry; Dr. Winfried Teizer, physics; and Dr. Choongho Yu, mechanical engineering.